NASA's New 'Intruder Alert' System Spots An Incoming Asteroid : The Two-Way A space rock zipped by Earth on Sunday night. Astronomers knew it didn't pose a threat, in part thanks to a new automated warning program called Scout. Asteroids regularly pass by Earth, as depicted here. A new NASA system called Scout aims to identify the ones that will come closest to the planet. 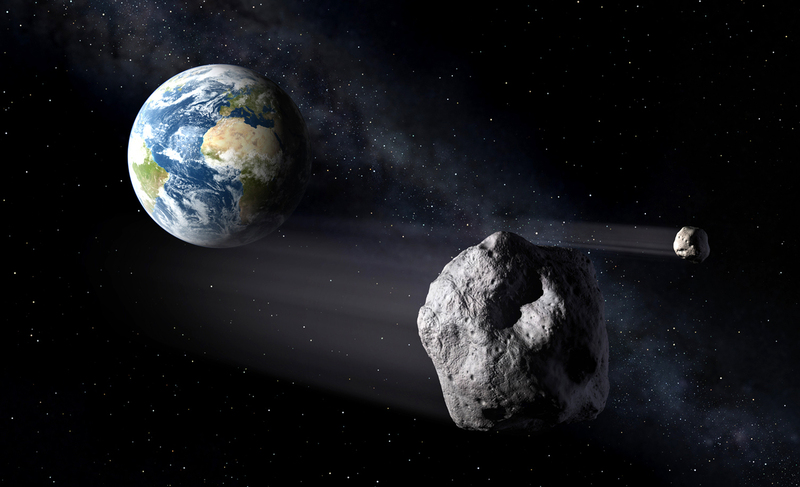 A large space rock came fairly close to Earth on Sunday night. Astronomers knew it wasn't going to hit Earth, thanks in part to a new tool NASA is developing for detecting potentially dangerous asteroids. The tool is a computer program called Scout, and it's being tested at NASA Jet Propulsion Laboratory in Pasadena, Calif. Think of Scout as a celestial intruder alert system. 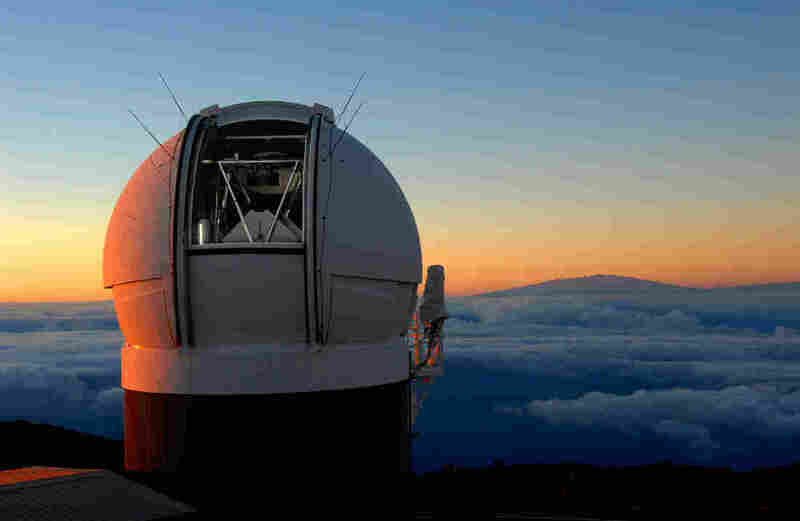 It's constantly scanning data from telescopes to see if there are any reports of so-called Near Earth Objects. If it finds one, it makes a quick calculation of whether Earth is at risk, and instructs other telescopes to make follow-up observations to see if any risk is real. NASA pays for several telescopes around the planet to scan the skies on a nightly basis, looking for these objects. "The NASA surveys are finding something like at least five asteroids every night," says astronomer Paul Chodas of JPL. But then the trick is to figure out which new objects might hit Earth. "When a telescope first finds a moving object, all you know is it's just a dot, moving on the sky," says Chodas. "You have no information about how far away it is. "The more telescopes you get pointed at an object, the more data you get, and the more you're sure you are how big it is and which way it's headed. But sometimes you don't have a lot of time to make those observations. "Objects can come close to the Earth shortly after discovery, sometimes one day, two days, even hours in some cases," says JPL's Davide Farnocchia. "The main goal of Scout is to speed up the confirmation process." The rock that whizzed past Earth tonight was discovered on the night of Oct. 25-26 by the NASA-funded Panoramic Survey Telescope & Rapid Response System (Pan-STARRS) on Maui, Hawaii. Within a few hours, preliminary details about the object appeared on a Web page maintained by the Minor Planet Center at the Smithsonian Astrophysical Observatory. Scout did a quick analysis of the preliminary details and determined that the object was headed for Earth but would miss us by about 310,000 miles. A telescope in Hawaii first spotted an errant rock headed toward Earth. The Scout program quickly flagged it for follow-up observations. Additional observations by three telescopes, one operated by the Steward Observatory, another called Spacewatch, and a third at the Tenagra Observatories, confirmed the object would miss Earth by a comfortable margin. Astronomers were also able to estimate the size of the object: somewhere between 5 meters and 25 meters across. In case you're interested, full details about the object's trajectory can be found here. Scout is still in the testing phase. It should become fully operational later this year. Now Scout is mainly dealing with smallish, very nearby objects. Complementing Scout is another system that is already operational called Sentry. Sentry's job is to identify objects large enough to wipe out a major city that might hit Earth in the next hundred years. "Our goal right now is to find 90 percent of the 140-meter asteroids and larger," says Chodas, but right now he estimates they're able to find only 25 to 30 percent of the estimated population of objects that size. That number should get better when a new telescope being built in Chile called the Large Synoptic Survey Telescope comes online. NASA is also considering a space telescope devoted to searching for asteroids. OK, so let's say you find one of these monster rocks heading for Earth. What then? Astronomer Ed Lu says there is something you can do. He's CEO of an organization called B612. It's devoted to dealing with asteroid threats. "If you know well in advance, and by well in advance I mean 10 years, 20 years, 30 years in advance, which is something we can do, " says Lu, "then you can divert such an asteroid by just giving it a tiny nudge when it's many billions of miles from hitting the Earth." NASA and the European Space Agency are developing a mission to practice doing just that. Lu says in the past decade, people who should worry about such things have begun to make concrete plans for dealing with dangerous asteroids. "I believe in the next 10 to 15 years we'll actually be at the point where we as humans can say, 'Hey, we're safe from this danger of large asteroids hitting the Earth,' " he says. In the meantime, we'll just have to hope that luck is on our side.